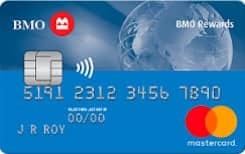 Welcome offer: Welcome offer: Get up to 20,000 BMO Rewards welcome points and a 1.99% introductory interest rate on Balance Transfers for 9 months, 1% fee applies to balance amounts transferred. This CAD currency 15 is issued by Bank of Montreal and runs on the MasterCard Network. The purchase interest rate for this credit card is: 19.99 percent annually and the transfer balance interest rate is: 22.99% per year. Also the cash advance rate is: 22.99% per year. Travel cancelation is Not available for this credit card and also travel accidents are Not available.